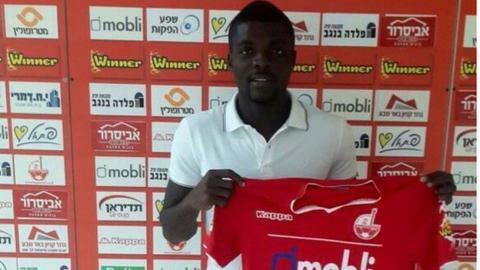 John Ogu is hoping his move to Israel's Hapoel Be'er Sheva can help resurrect his international career with Nigeria. The midfielder has sealed a four-year deal with Hapoel Be'er Sheva after his contract with Portuguese club Academica de Coimbra was ended by mutual consent. The 26-year-old was part of the Super Eagle's Confederations Cup squad but has not played since last November's 2-2 draw against Italy. "I'm delighted I've joined a club that believes in me," Ogu told BBC Sport. "It's a great opportunity for me to play again, give my best and help the club achieve their aims and objectives. "If I work hard and do well here, hopefully I'll get another chance with Nigeria." As well as going to the Confederations Cup, Ogu played in three World Cup qualifiers but was omitted from the squad for the finals in Brazil by coach Stephen Keshi. But after watching the Super Eagles crash out of the World Cup in the Round of 16, Ogu insists he still has plenty to offer once he rediscovers his form at club level. "You watch Nigeria's games and still want to be playing, singing the national anthem and fight for your country," he said. "The first thing I need to do is to get back playing here in Israel regularly and leave the rest to the Nigeria coach to decide." Ogu will be counting on a compatriot for support at his new club in the form of Nigeria goalkeeper Austin Ejide. "Ejide has been there for a while now and he told me nice things about the club," he added.